Oh hey. Welcome back to the real world. "Good to see you! ", said no one ever after a three-day weekend. On the bright side, though, we're one day closer to the next weekend. After spending the MDW out in Montauk, now seemed like as good a time as ever to introduce a new series, Weekend in a Snap. The title is pretty self-explanatory, but essentially it will be snaps from the weekend. I'll be mostly using my Instax to capture these moments, but I'll also be including more in-the-moment outfits, pictures that didn't make the cut for full posts, tidbits of things we did and Instagram pictures you might have missed. This is just one in a series of new posts I'll be rolling out over the next month as I prepare to launch the new site. I really hope you enjoy it, and as always, if you have any feedback, don't hesitate to let me know! 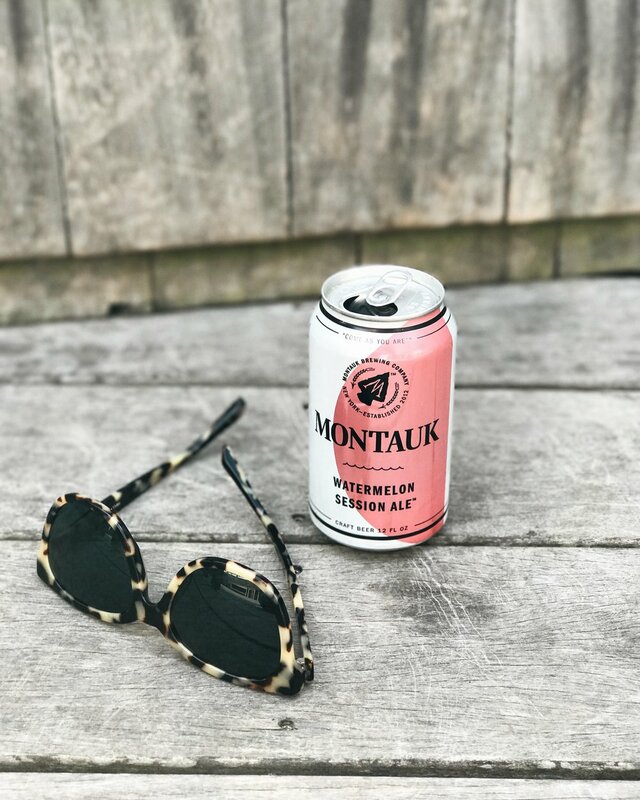 *Finally tried Montauk Brewing Co.'s Watermelon Ale...and then continued on drinking it the rest of the weekend. It's easy to see why it's such a favorite. *I always love doing the short and easy hike at Shadmoor Park as the view is nothing short of gorgeous. With the turquoise water crashing below, the rugged cliffs worn away by the elements and the surfers in the distance, it makes for a truly picturesque moment. *It never fails that I'll pack a suitcase full of clothes, but still somehow only wear the same thing the entire trip. Montauk was pretty chilly so this sweater (Yes, I know it's a men's sweater. But hi! It's 100% cotton and under $20. Oh, and FYI, I got it in a small, as I wanted it to be oversized + leave room for stretch. ), jeans and sneakers combo was this trip's repeat offender. *Speaking of packing, my new sunnies c/o Warby parker arrived right before we left, and I'm so glad they did. They were perfect for Montauk and I pretty much didn't take them off the entire time, even when it was gray out! *Want one of the best lobster rolls of your life? Make sure you stop at The Lobster Roll. There's always a wait but it's always worth it. I typically prefer my lobster rolls hot with butter but their classic lobster salad roll is a must, as are the clam strips, New England clam chowder and make sure you save some room for the homemade cupcakes (the chocolate is one of the best I've ever had). *When I wasn't wearing the cream colored knit sweater, I was wearing my favorite striped sweater. Sadly, it's no longer available online, but I've linked several similar options below. 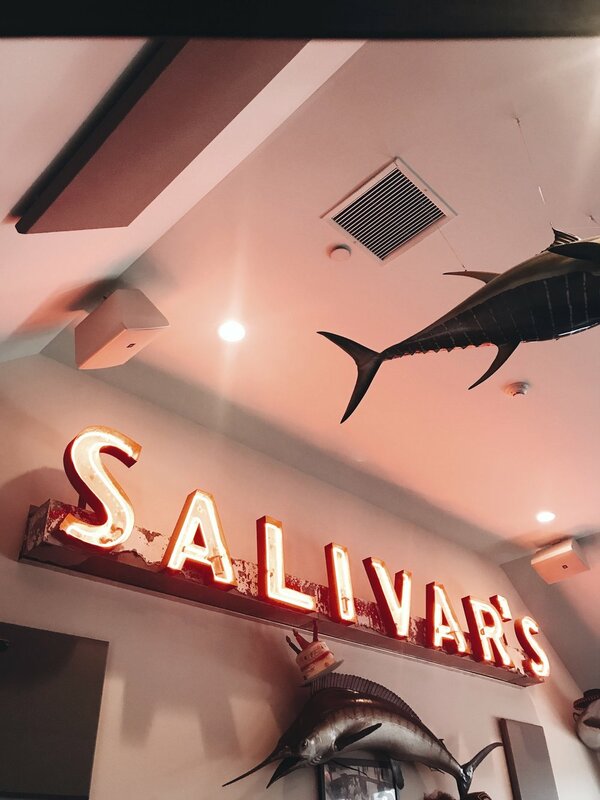 *My favorite place to go out in Montauk is, hands down, Montauket. The sunset views can't be beat. Plus, they have live music and great drink prices. Just make sure you get there early to catch the best views. *Another Montauk favorite is driving out to the lighthouse. You have to pay to park and go in, so we've never actually stopped there, but I still enjoy rolling down my window and snagging a picture as we drive by. *We went to Saliver's for dinner one night. It was our first time there, but it definitely won't be our last. The portions are massive (perfect for sharing) and everything is very flavorful. The garlic bread is delicious as is the mahi-mahi and I loved the beet and arugula salad I got.